I used to be a heavy user of After Effects, I am wondering if there is a similar effect to echo in Blender. That is used for simultaneously showing a specific animation in the future and the past simultaneously. Edit: In addition to Leanders answer below, is there a simple way to fade the transparency or change colors of the frames before and after. Perhaps somehow linking the generator setup with the frame duplication to a transparency node? There is a function which creates a very close effect to the one you're describing. In the Properties Panel, go to the object section and under Duplication, select Frames. Duplicates of the object in its state from the specified Start and End frame are shown on all frames. To create the echo, set a keyframe on both properties. Then, go to the graph editor and add a Generator modifier to both curves. By choosing a lower offset for the Start Frame property you will have a span of frames which are shown. You can use the animation nodes addon. Install it and enable it. Then, in the Nodes editor a new Node Type button will appear: the animation nodes node type. With it we can create time offset instances and modify the material of those instances. I am using a vertex color Col, which is modified for each instance. 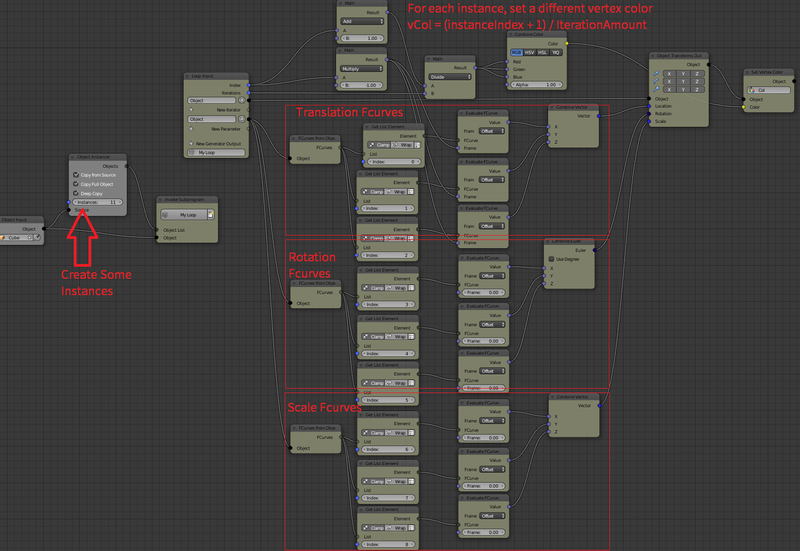 This is the animation nodes node tree. I won't explain every node in detail, as they are well documented. plug the list of instances into a loop. The loop receives a list of objects and a reference to the original object. The list of object will provide a reference to 1 instance on each run of the loop. In the loop, the fcurves for translation, rotation and scale are evaluated at a time different to the frame right now. The evaluated frame is offset -1 of the current frame per loop run. This is how the objects are offset in the 3D space. Obviously, this doesn't account for other deformation like modifiers (armature), shapekey and other. Not the answer you're looking for? Browse other questions tagged rendering video effects timeline compositing or ask your own question. How to add a Ghost Type Effect?